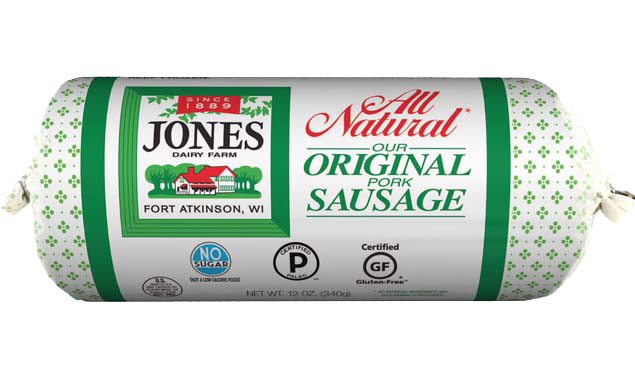 The sweetness of challah bread, apples, cranberries and maple syrup are balanced by the savory addition of Jones sausage. Spread cubed challah bread onto two rimmed baking sheets. Bake 15 minutes. Remove bread and place in large bowl; set aside. In medium non-stick saute pan, add 1 tablespoon olive oil and sausage. Break up sausage as it cooks, sautéing until browned, about 5-6 minutes. Remove sausage from pan and place on plate lined with paper towel to drain. Increase oven temperature to 350°F. Add remaining 1 tablespoon olive oil, onion and apples to same pan. Saute 7-9 minutes, until onions are slightly browned and apples are soft. 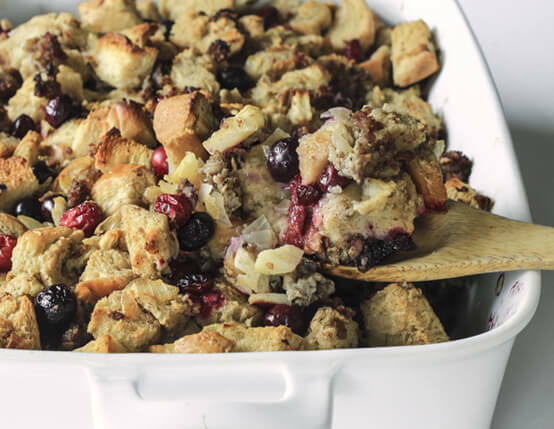 Add sausage, onion mixture, blueberries, and cranberries to large bowl with prepared bread. In medium bowl, add eggs, vegetable broth, maple syrup, cinnamon and allspice. Whisk until combined. Pour over dry mixture in large bowl. Toss to coat, making sure all bread is wet and thoroughly combined. Pour stuffing mixture into buttered 13x9-inch baking dish. Bake 45 minutes. I made this recipe for a family thanksgiving gathering last year and this year my mother-in-law messaged me for the recipe because she said it was the only stuffing recipe her husband wanted! The flavors are unique and compliment each other so well - there were NO leftovers.